Development of cold environments creates opportunities and challenges. Cold environment areas are often wilderness areas that are extremely fragile, small perturbations within the system can have catastrophic effects. However, there is enormous mineral wealth in the tundra, and the potential for tourism, fishing, hunting and logging. It is for this reason that many of these areas are decidedly under threat from EXPLOITATION. The Russian tundra has been exploited for mineral deposits such as phosphates, gold, tin, natural gas; and most recently the Russian government has announced a plan to use nuclear powered oil rigs to exploit oil reserves in the Arctic Ocean. The USA has the world famous Trans Alaska pipeline which traverses Alaska from its hugely valuable oil fields near to Prudhoe Bay next to the Beaufort Sea in the North of the State southwards to Valdez on the Pacific Ocean. In addition, North American tundra has reserves of gas, gold, silver, iron ore and copper. The tundra is one of our most Northerly ecosystems and covers a huge tract of land running between latitudes of 50°N (where there is no modifying sea influence) to 80°N. This means that winters are long and cold, minimum temperatures are very low, with some mean monthly temperatures as low as MINUS 25°C, with little influence from the sea and ocean currents. The Iñupiat people are hunter-gatherers, as are most Arctic peoples. Iñupiat people continue to rely heavily on subsistence hunting and fishing. They harvest walrus, seal, whale, polar bears, caribou, and fish. When they are available they also gather food staples such as ducks, geese, rabbits, berries, roots, and shoots. Whales are shared amongst the community and the skin and blubber of Bowhead and other whales, is rich in vitamins A and C. The meat is eaten raw to preserve the vitamins and these vitamin-rich foods contributes to good health in a population with limited access to fruits and vegetables. Permafrost is permanently frozen ground where soil temperatures have remained below 0 °C for at least 2 years. It develops because of the cold temperatures but the surface layer does melt in the summer. This layer is known as the Active Layer. This poses big challenges in the summer for developing the Tundra because this layer can be very mobile. This moving soil layer can make buildings sink and subside, roads to crack and even make trees topple and fall, so called “drunken Trees”. In the winter, the water freezes which makes finding water supplies difficult. The freezing soil also expands upwards due to the process of frost heave. This means people have had to adjust. Roads are constructed of gravel, and houses are often built on stilts to reduce the risk of subsidence. The depth of the permafrost is larger at higher latitudes, and the active layer which seasonally melts, increases in size and movement generally as we move to slightly warmer climates. This can be seen on the transect diagram below, from Resolute in Northern Canada to Hay River at lower Latitudes. Many cold environments are sparsely populated and have few communication links going through them. This makes them difficult to reach (inaccessible) and people may not be able to rely upon reliable supplies of food and energy. This encourages people to rely upon themselves and be self-sufficient. Some cold environments are ironically more accessible in winter, when frozen roads and roads built on ice (see the McKenzie River ice road below) allow easier passage than on roads that crack and shift in the summer. The inaccessibility can isolate people but can also carry advantages. Governments can put some of their more sensitive buildings in such areas. In Svalbard, a set of islands to the North of Norway there is the Svalbard Global Seed Vault, where seeds of plants from all over the world are stored in an attempt to insure against the loss of seeds in other gene banks during large-scale regional or global crises. To have buildings in cold environments people have had to adjust how buildings, roads and pipeline are constructed. Buildings can collapse if built on top of melting permafrost and pipes can be damaged in melting soils as they are more likely to move. Roads are more prone to cracks, potholes and land slips in summer. 2. Roads are built on gravel to prevent them cracking with frost heave. 3. Geothermal power is used where underground pumps pump water deep underground where it is warmer and then bring that warmed water back to the surface to heat buildings. 4. Buildings have steep pitched roofs to get rid of the snow that falls. 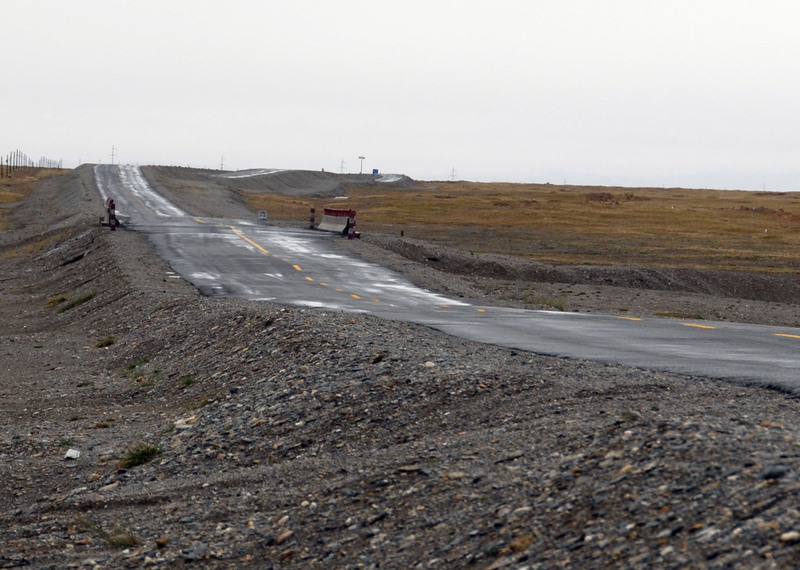 A damaged tundra road - Image/photo courtesy of the National Snow and Ice Data Center, University of Colorado, Boulder.